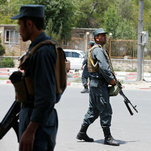 Conversations with diplomats and senior officials in Kabul suggest that the recent unilateral cease-fire announced by the government had been sudden, uncoordinated with the Taliban and not the outcome of a broader, cohesive peace effort. Over the past few years, as the United States has drawn down from the peak of about 100,000 troops in Afghanistan, it has increasingly embraced a political settlement as the only end to the long Afghan war. But just how that settlement could be negotiated has proved to be a difficult task, compounded by several factors, including the Taliban’s long but increasingly complicated relationship with the Pakistani military as a source of support, a weak interlocutor in the government in Kabul that’s marred by infighting, and the breakdown of consensus among regional players like Iran and Russia, who have stakes in an endgame in Afghanistan. Although initial contact between the two sides brought sporadic success, there have been many setbacks. The only time the Afghan government came close to initiating substantive direct talks with the Taliban, in the summer of 2015, the process was derailed by news that the insurgent envoys they were meeting had, in fact, come in the name of a Taliban supreme leader who had died years before, the news of which had been kept secret.